Organized and pretty? That is the name of the game around here! And I love what superstar reader, Cas from Clutterbug.me, created for her kids! "I wanted my three children to have a place to play, create and MAKE A MESS! I rotate the toys often, so it's always a place they want to spend time and play in." "Love a labeled bin system. It's easy for my little ones to find the toys they want and just as easy for them to put everything away in it's proper 'home'." What items did you find were essential in organizing the space, and why? "My girls love doing crafts, so creating an art center was essential for the space. I used an old, low book shelf to hold all of their craft supplies in easy-to-access containers. With all the supplies being visible, they are inspired to really get creative with their masterpieces!" We went with a "garden" theme to bring some of the outdoors in during the cold winter months. My husband made the picket fence headboard for the daybed and hung pretty butterflies and flowers in the room. We recently had a baby boy! I can easily make the "garden" theme gender neutral by adding some fun bug decals and brightly coloured kites to the space. My girls made the artwork for the room and I love how their hand and foot print art is also a keepsake for me! 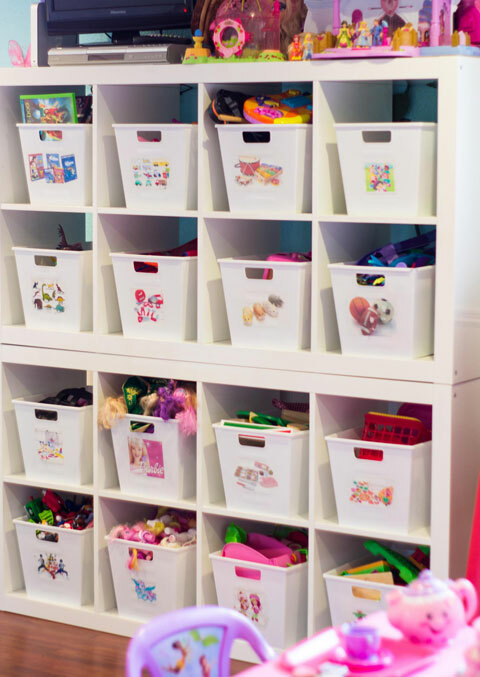 I LOVE organizing on a dime, so I bought the white plastic bins from the dollar store! To label them, I printed out pictures from Google images on full sheets of clear labels and stuck them right onto the bins. I've had the same bins for a few years and the labels have held up great! If we change the toys, we simply peel off the label and print a new one! With each bin being only a dollar, it was a real budget saver! I'm never stressed out about toys being all over my living room floor! I'm a bit of a neat freak when it comes to the rest of the house, but in the play room, they can just have fun and go crazy. I completely agree with my gal Cas. I know not every home is cut out for a playroom, but if you have the space, they are fab sanity savers, for both kids and the parents. Let's chat quickly about what makes this room so heart worthy! It just screams happiness and creativity to me. I can picture myself sitting in the room and being swept away to a garden tea party where us gals sip tea, paint our fingernails and chat about all sorts of giggly girl things. I love that it promotes art and free play. 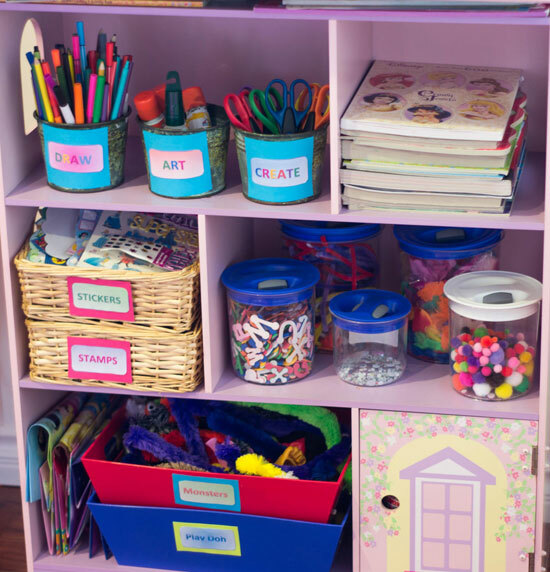 I adore that the storage is all labeled to it is simple for the kids to maintain the space. Dollar Store bins and labels. Enough said. The overall setup of the room is super savvy too, because there are defined zones for different types of play. The versatility factor rocks! The fact that it can easily be updated to suite both boys and girls was a really smart mommy move. That daybed, how darling is that? What a great place for the kidlets to snuggle up with a good book. When can I move in? A special Thank You to Cas for taking the time to share her darling play space today! You can find all the details on her blog here. 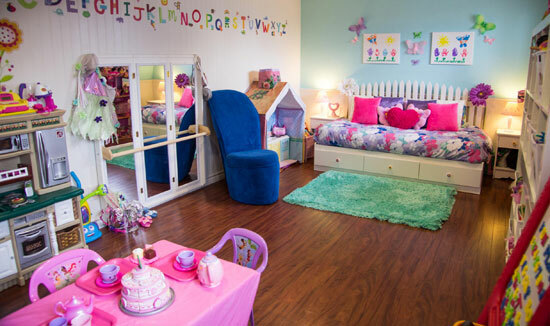 Raise your hand if you love your playroom more than any space in the house. Me me me! 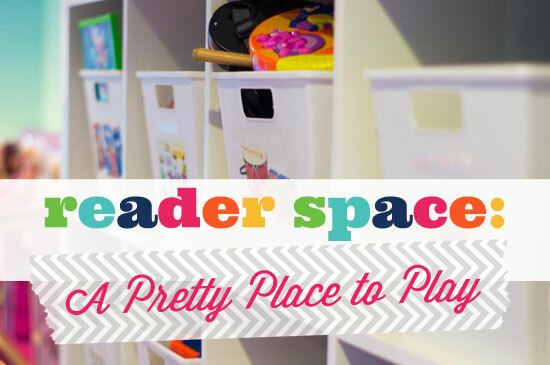 What are your favorite playroom tips or "rules"? 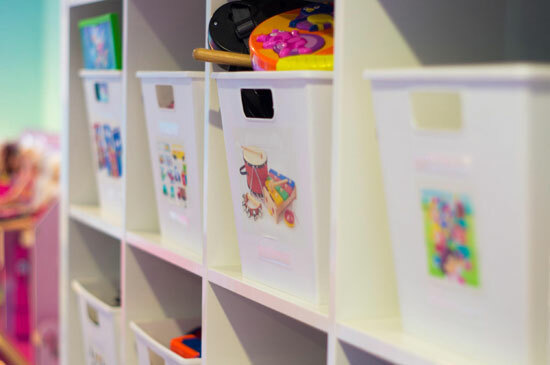 What about top tips for organizing toys when an entire room dedicated to play, is not an option? Beautiful! Hopefully I can have a space like this one when I have my kids! Cute space! Before moving we had a play room but our new house didn't have space. I can't say that I miss it though. We found we couldn't put (and still can't) a ton of toys out at once. I labeled bins and did all of the tricks of the trade that everyone else does yet it didn't work. At the end of the day we were left with every bucket dumped on the floor and struggling to get our kids to pick it all back up. I struggle with how to give 5 kids enough toys to play with without toys taking over our house. 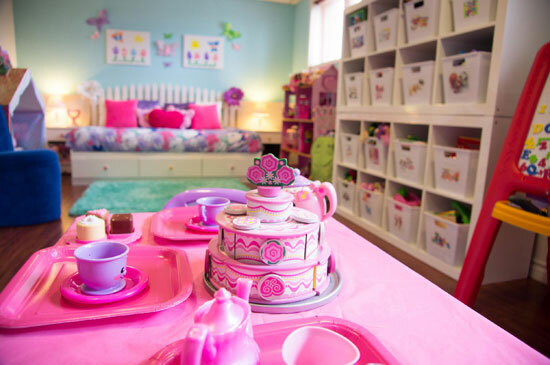 Even with a dedicated play room, toys wondered to other parts of the house. Looks GREAT! I love that she used a theme and was able to make it so cute on a budget! We don't have a dedicated playroom, but we sort of "created" one by cutting our living room in half; one half houses the TV and seating, the other half has an Expedit with bins of toys and a train table. It has been a nice set up for us! Thanks for sharing this awesome space! Beautiful! We are working on converting our "throwallourstuffinit room" to a real usable guest room/play room right now!!! Great inspiration! Which Dollar Store has these? We have Dollar Tree and another one around here? I too own the same bins in a GORGEOUS light blue color and I can't wait to move into my new house and have my own organizing story to share!! These bins have been great for my daughter and are so adorable. Now I need to go make those labels! Thanks for sharing! It's great! I love cubbies...like obsessed. Amazing! I wish I had that much space for a playroom!! so lovely! I'm really crushing on the bed frame picket fence! Wow! I think this is my favorite reader space. I literally just pinned about 4 images. Love it! 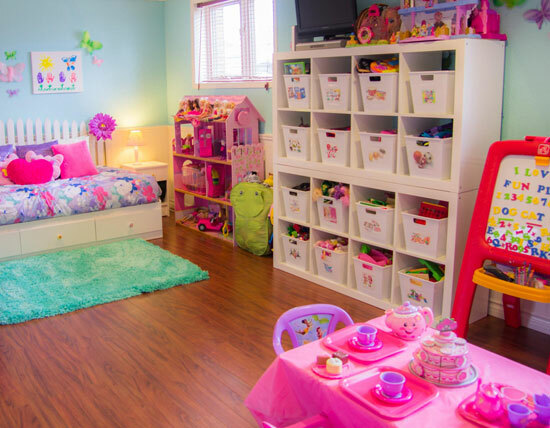 We do have a playroom, and I am dying to make it as pretty and functional as this space! Wow! This is such a lovely room! I am really moved by this post, I would like to change the play room of my kids turn it into something like this. The room is so neat, organized and all! I like the design so much. I'm sure my wife will also love this. I have loved Cas for years. She sent me to your site years ago. When I was stressed and unhappy with my house. With a bizzy 3rd old and a brand new baby. You both have inspired me to get my house inorder to have more time and less stress with my kiddies. Fast forward 4 years later and I am a organized have it together mom, in control of my life. I owe it all to you Ladies. Thanks and keep up the good work. I heart you. My goodness that is just so sweet of you to say! Thank YOU for the kind comment, made me grin cheek to cheek! I need to get motivated and organize! this is great! Such a great play space! I am an interior designer in LA and I specialize in nurseries and children's rooms, one of the biggest challenges I tackle when designing a child's space is storage. It is essential to keeping your home organized and tidy. But its also another place to add in some fantastic design elements. Thanks for sharing! Hi Cas! I just checked out your blog and saw your video post about your kitchen cabinets. Your dilema makes sense. I had a thought that you didn't mention. Why not go pick up a few new drawer and cabinet pulls in a darker shade like black or oil rubbed bronze to bring out the espresso color you mentioned in your back splash? Install them on a few cabinets to see if it creates the cohesiveness you are looking for without going all out and staining to almost black right away. You seem a bit hesitant to go as dark as that, and I thought that this might be a solution instead. You can always return the knobs and pulls if you don't like how it looks. Just a thought. Your home is very pretty, by the way, and your personality on camera is charming! Thanks for THIS post here at iheart too. Lots of great ideas! My four year old daughter just said: "Can we get that?" lol I agree, it's lovely and I totally want to create something like this in our playroom. I love this room! Where did you get the white shelving from? It looks like she used the white Expedit shelves from IKEA, which is now named the Kallax series.